Little squares of fabric sewn onto paper. Tones of dove grey, jacaranda and mustard, interspersed with hints of French pink, olive and teal. I hope in the stitching a quilt will come together that offers comfort, warmth and a story to tell. Of Poet's first Christmas and the magic of the season. As the owl says to Applesauce: "Christmas comes from the heart, Pig, from the heart." Issues of the heart are all-consuming as are the ever-rolling lists in my head. The ticks never exceed the to-dos. The outgoings are increasing, the income is staying the same. It's an issue that gets thrown around this online world in abundance...housework and money are hot topics, didn't you know. I was talking to a wise woman recently about my blog. "I started it as a gratitude journal," I told her. "I found that I was always wishing I had more, hoping a better house would be in the near future, wanting more money. I wasn't entirely happy because I was so consumed with what I didn't have. And so I started focusing on what was already in my life and it didn't take long for me to realise that I was surrounded by what was important - a supportive, loving partner, a beautiful child, a safe and comfortable home, fresh, organic food, a pile of good books..."
When the normalcy of the daily routine becomes a little blasé, when the bills pile up and the work slows down, when there's an ongoing battle between the head and the heart, I take photos, gather my thoughts and bring them here. A practice in gratitude. And it always works. Why do you write your blog? Poet attended her first wedding on Saturday night. The verdict? She likes to party. Seriously party. She even thought she was important enough to hang out at the bridal table for a while there, entertaining the bridesmaids between the main and dessert. As for this week's feats...she's got the coy 'I know I'm gorgeous but I'll act nonchalant' look mastered and she's getting rather good at blowing raspberries. Dribble, anyone? The past few days she has been referred to as Miss Squawk-a-lot...hmmm, she looks sweet but she can scream like the best of them. Dress: an op-shop find from years ago. I remember thinking: "I'm sure I'll have a baby girl one day, I'll buy it just in case." I tend to get a little uncomfortable around this time of year. You've probably felt it too - the rising anxiety of a community itching to get their hot little hands on this and that (and also this) before the big man in red gets in his sleigh. Che really gets the Christmas thing this year and he's subsequently bursting with excitement. We've been reading Christmas books, discussing the 'magic' and reminding him that it's a good time of year to be grateful and happy. The gift giving and receiving is worthy of many a daydream too. We went to sushi train after his swimming lesson today and I sat with him in the little corner of calm while watching the chaos of the shopping centre merely metres away. Trolleys were overflowing with plastic fluro and every second person wore a frantic look of desperation. They definitely weren't having a jolly ole time. It's so easy to get swept up in the fast-pace of a busy shopping centre, so easy to go along for the consuming ride. We never go overboard at Christmas time and this year is no exception. We'll buy a tree like last year, decorate it, make baked goodies for the neighbours, play Christmas carols and generally stay close to home. The gifts we buy are small yet sincere (although Che is getting a bike - and might I add that it was incredibly difficult to find one that didn't have flames all over it?!) - wrapped with Che's paintings and tied with re-used string. I've made a point of asking friends to hold-off on the gifts for Che and Poet - they have so much already. While Lego is clearly the best toy Che has ever owned (he spends hours upon hours building, creating, imagining and problem-solving) it's the mudpies that get the biggest smiles. "Only a mother can understand the joy of locking eyes with her newborn babe the moment they take their first breath. Natalia was one of my yoga students...it was a blessing to teach her and compare belly notes as we grew our baby girls at the same time. Her midwife, Lisa from Bella Birthing, is a new independent midwife on the Central Coast and has supported two of my students in their pregnancy and birthing journeys (I hear she is absolutely wonderful). I know exactly what Natalia was feeling at this moment, when she held little Estelle for the first time. If you're a Muma, you know what this feels like. Which is why you should head over here and vote 10/10 for this photo in the 2011 National Geographic Photo Contest. Natalia was supported by Lisa in the comfort of her own home and birthed her baby girl in the water. This photo is proof that homebirth is a safe and joyous option for those who choose it. 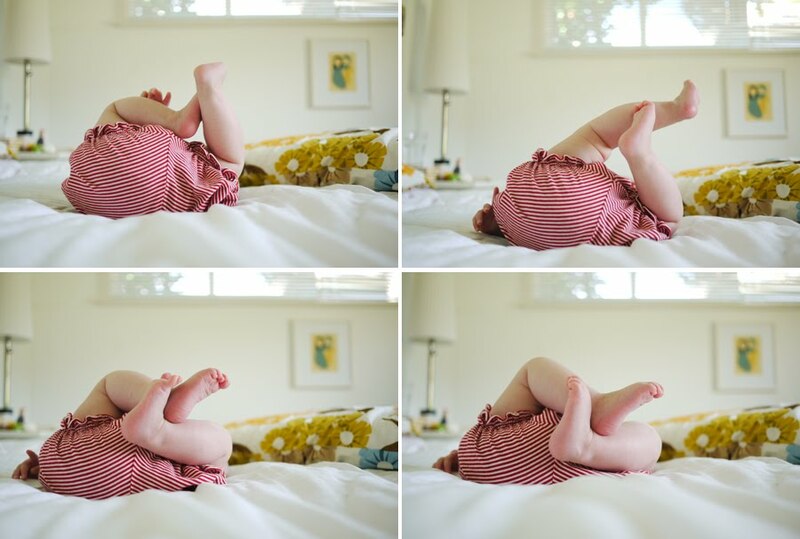 Proof that homebirth is good and normal and natural. For more homebirth inspiration, look here. ...and the cloth nappy journey begins. At least once a fortnight we go to our favourite local cafe and indulge in a few hours of bliss. 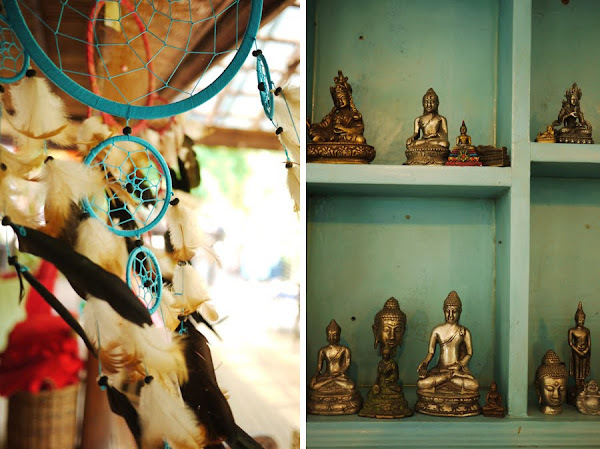 Bamboo Buddha is my idea of a perfect cafe - wholesome vegetarian food, organic coffee, Balinese day beds and a trickling fish pond. There's little paths in and out of the trees, around and about the pond, and Che spends hours circling them. He wanders up to the kitchen by himself and asks the girls for a cup of fish food (you can see it in his hand in that first photo) and proceeds to sprinkle the lurid orange flakes into the water. Yesterday we went there for morning tea and ended up staying for lunch. For three and a bit hours we lay on the day bed listening to the birds and the beetles. Poet slept, I took photos and Daniel shot film. Che played the Pied Piper and took some other little kids on a "lizard walk." When we left we felt like we'd been on a holiday. Truly - we floated home. Che wears this years hazyjane pants. He also wore them in 2010 and 2009. I buy two new pairs for him each year because you can't go past handmade, mama-made, vintage floral cotton pants for our hot, hot summer. Babies don't stay new for long. Just this afternoon I witnessed her roll onto her belly, lift her head high and then gaze around with a new love of the world. Another first. She was so proud of herself. And I'm so proud to be her Muma. I told Tim today that parenthood is addictive. Did you know that Tim and Kesh are having a baby? Pirate Che on his unmade bed/turbulent sea attended his second party of the week which confirms that he's got a better social life than his parents. Poet has just become a bit of a chatterbox. If she's not sucking on her hands, she's gesticulating wildly and squawking like the morning birds (at sunrise!). There's a rooster across the road too so clearly she's just joining in on the morning chorus. 3.5 months is when everything shifts. It still amazes me, on this second round of motherhood, that the bond between mother and baby is so very strong. I'm still so connected to her. The cord was cut but we still flow with the same rhythm. And just this past week, as she has opened those big eyes a little wider, found her sing-song voice and discovered her own strength, I felt the last of those pregnancy hormones vanish - hence I was tired, headachy and generally a little blah. The ebb and the flow of it. I have managed to pick myself up - I'm eating with more awareness, drinking plenty of water, getting into bed early and slowing down just a bit. I was feeling really good this morning. And then I dropped Che at Montessori. One of the dad's was walking towards me, he knows our family, met Poet only last week, and he pointed at (and touched!) my post-baby belly and exclaimed: "Oh, you've got another one on the way!" Did anyone say BIGGEST FAUX PAS EVER! I just keep telling myself what I tell every single one of my pre-natal students: "It takes you a year to conceive, grow and birth your baby. It will take a year for your body to return to (a semblance of) its former self." My mantra for the day - perhaps for the week. ...she wriggles her toes in the sunshine while I swoon over her milky white chubby thighs. My beautiful bonny baby.